At VMworld 2017, VMware announced the availability of VMware Cloud on AWS. If that wasn’t enough, a new VMware Cloud on AWS feature was announced at the AWS re:Invent 2017 conference in Las Vegas. The reason why VMware Site Recovery Manager (also known as SRM) changes the VMware Cloud on AWS game is quite simple. Let me bring you back to the datacenter of 10 years ago. Back in my day, we recovered virtual machines across sites with scripts if we were lucky. Some things just had to be done by hand. What is worse is all of the companies that had, and still have small datacenter or cages at some colocation facility someplace that they had specifically for DR purposes. Often they were not close to the production sites (rightly so), and besides being a pain to get to, they were a pain to get into as well. Scan your laptop, sign your life away, etc etc. Not to mention the dreaded DR test where we all had to do camp out someplace for a couple days. Even if we have two main datacenter that both run production and use the other for DR, it still isn’t cheap. We still have to power, cool, staff, and operate two different datacenter all in the name of the inevitable disaster (which always seems to happy when we least expect it, of course). 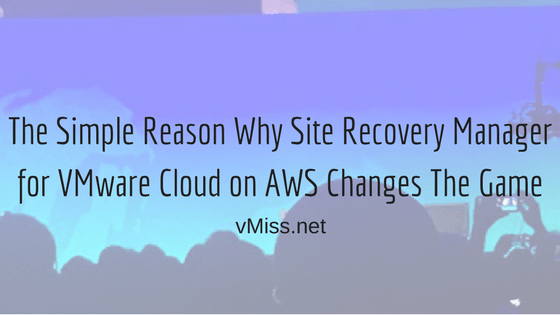 Once VMware introduced Site Recovery Manager, the recovery game itself changed. At least that part became much easier, but you still needed infrastructure to run on. Infrastructure that often sat and rotted un or underutilized while production chugged along happily. Back to the simple reason why SRM on and VMC on AWS changes the game. It’s easy. Kill the colo, rattle the cages, and topple the racks. No more dealing with any of that, simply use AWS as your recovery site and VMware SRM to power it. No more idle infrastructures, no more two day DR tests in some far away place. Instead, sit comfortably in the office, or at home in your bunny slippers waiting for your environment to fail over. VMware touts an effectively monthly price of $36 per VM per month, with a very interesting note. The service is metered hourly. Customers are billed monthly only for the number of VMs protected and for the number of hours each VM is protected. This creates a whole new slew of possibilities for simplifying our infrastructure. What if you protected critical virtual machines during maintenance only? For example, if I have a group of VMs that must always need to be running, I may have to have two extra hosts in my cluster (depending on its size) to ensure those VMs will be restarted by HA in the event of a host failure. Instead of hanging on to an extra host to protect against failure during maintenance, I could simply ensure they are protected on AWS during the maintenance window only. Many organizations are going to find the price compelling for piece of mind because, well, it’s easy. A solution like VMware Cloud on AWS allows organizations to focus on what they do best instead of worrying about keeping unused infrastructure running. It is also extremely easy to bring a new VMware host online with AWS, which will allow organizations to easily run in the cloud during a prolonged disaster. Know of any SRM + VMConAWS great resources I missed? Be sure to drop me a line on Twitter and I’ll add it here.